My Chappaquiddick garden must have some of the sandiest soil on the Island. 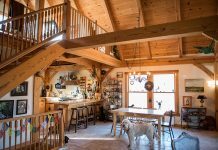 After 30 years of adding manure, compost, soil amendments, and mulch, it still resembles the beach more than dirt used to grow vegetables. Most all the annual-type vegetables I ever plant do poorly, if they even survive the bugs to grow past the seedling stage. 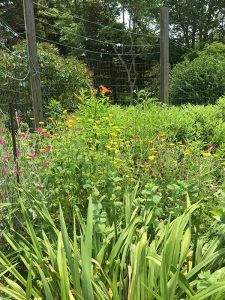 The volunteers — plants that seeded themselves from the year before — do much better, maybe because they choose where to grow. Instead of bemoaning my inability to grow what I think I want, I’m learning to cultivate lazy gardening practices. I’m already quite a few steps down the free-range garden path that leads to nature’s choice. Whatever wants to grow in my garden, I say, go for it. That doesn’t mean I won’t be weeding out some things. Although I’ve taken to eating foraged food from around the yard, fields, and shore, I still do have preferences when it comes to weeds. I’ve ripped up large swathes of dead nettle and creeping henbit, but I’m leaving the cleavers, plantain, and regular nettles, for now. They’re some tasty and medicinal weeds. Some of the perennial vegetables I’ve planted in the past have spread; some would like to take over the world. For example, the wild arugula that I brought back as seed from a French roadside 10 years ago: It’s my best weed, most loved by others, even if it’s a little strong-tasting for me. It has been busy spreading to every corner of my yard, including the cracks between the bricks of what I call the chicken patio (where the flock likes to sun itself). I hope I’m not starting a new invasive species. People love this arugula’s spicy fresh taste, and it’s been the main cash crop of my very small vegetable and herb business. It amazes me that some people will even drive the mile of potholed dirt road to my house to pick up a bag of it. 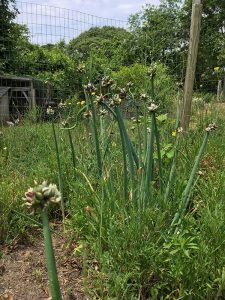 The walking onions, also called tree onions or Egyptian walking onions, have walked to every part of the garden, and out beyond the fence to various parts of the yard, too, and I’m fine with that. 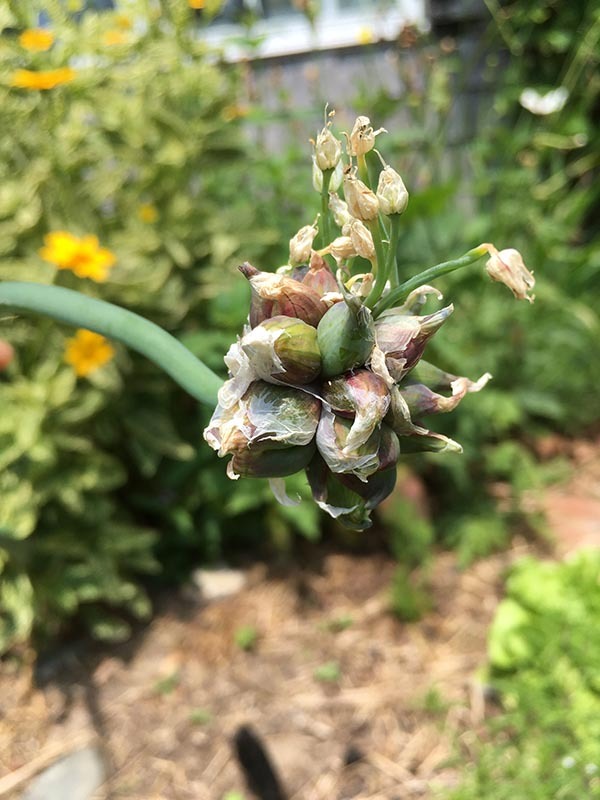 They’re tasty in all stages, and interesting to look at as their topknots burst into new colonies of tiny green onion seedlings which will eventually fall over and root themselves. Walking onions are a little tedious to prepare, but handy to have when you run out of regular onions. They make good scallion substitutes, and are usable almost year-round. As far as the raspberries that I dug in temporarily while I prepared a bed for them, six or seven years ago, I’m ready to say that they can stay. They like to spread, too, but not like wildfire, not like cleavers. They just need a gentle reminder to behave. I had thought of trying to contain them in some way with boards in the ground, but I’ll probably continue to opt for the less ambitious occasional pulling up of suckers. Of the herbs I’ve planted, some make a stand against the weeds and arugula, and even spread. Others have left the garden for spots they like better, as the thyme did, establishing a nice big patch in the lawn outside the fence. Flowers are a perennial I’ve only allowed into the garden in recent years. In my early gardening years, I didn’t believe flowers belonged in the vegetable garden, but I’ve come to like the mix of flowers and vegetables. My phlox have won prizes at the fair, and the daylilies are yummy to eat as well as look at, so they’re allowed to proliferate. Perennials really are the way to go. They come up early and survive in much more trying conditions than annuals can. They like to spread with little or no work on the part of the gardener, like my asparagus has. I planted some years ago, and it’s seeded itself to several other spots. This year, for the first time, I’ve had so much asparagus I’ve started to get tired of it. The lower bed of my garden is reserved for the Jerusalem artichokes, which regrow every year from the uncollected tubers. Even when I think I’ve dug them all, I need to pull out about half the spring shoots, or they would take over the whole garden within a couple of years. The tubers are good for digging from late fall through early spring. My latest experiment in lazy gardening practices is growing garlic as a perennial. A gardener I met told me that instead of harvesting every garlic bulb, he leaves a few plants in the ground to grow new bulbs on their own. I did that last year, and this spring I’ve enjoyed some yummy green garlic shoots, and expect some bulbs from what I left to grow. I’m leaving some potatoes to do the same thing. Full disclosure: I also garden in two other locations that have real dirt instead of sand, where I can actually grow some annuals. 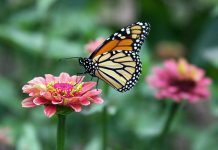 Those gardens are also a mix of edible weeds, flowers, and vegetables, all grown with the minimum of work. One is shared with my daughter. In recent years I’ve spent more time collecting edibles from the wild, and gleaning. These seem like more sustainable practices for growing old. I like going with the flow in gardening, taking advantage of what appears on its own. I have a peach tree in my garden that came from compost. I questioned the wisdom of having a tree in the vegetable garden, but now I’m perfectly content with it there. Several of its progeny have grown in other places around the yard. On them, I’m trying the pruning method that gives you a tree no taller than yourself, so you can always reach all the peaches. On the original peach tree, I prune the suckers most years so it doesn’t grow too much, and its limbs shade the gooseberry and nettle crops below. I have also questioned the wisdom of nettles in the garden. I keep getting stung as I pick the nearby asparagus. Now that nettles have spread to a couple of other locations in the yard, it’s probably time for me to take them out of the garden. Someday, when I’m really feeling ambitious … would I ever feel that ambitious?